DART received 60 entries for the Tell Your Transit Story contest last month, some from regular readers of the bus blog. The winners were announced at last night’s DART Commission meeting. Grand Prize – Jennifer Deutmeyer, a marketing and communications consultant for the Principal Financial Group, for her video showing how she travels the world with help from the money she saves by riding public transit. First Place, Energy Independence category – Alexander Grgurich, a former Norwalk City Council member and the director of Foundry Coworking, for his essay about his growing commitment to public transit as he runs his downtown Des Moines business without a car, relying instead on his bike and DART. First Place, Quality of Life category – Myrtle Storm, a resident at The Rose assisted living facility, for her essay titled “Myrtle’s Bucket List” on how she used paratransit service to go to the Iowa State Fair on her own and fulfill her lifelong dream of riding the Double Ferris Wheel. First Place, Economy category – Jessica Triggs, who recently started commuting nearly 200 miles daily between her home in Mount Ayr and a new job in Des Moines, for her essay on how she held on to her new job – and her sanity – by joining a RideShare vanpool instead of driving herself each day. 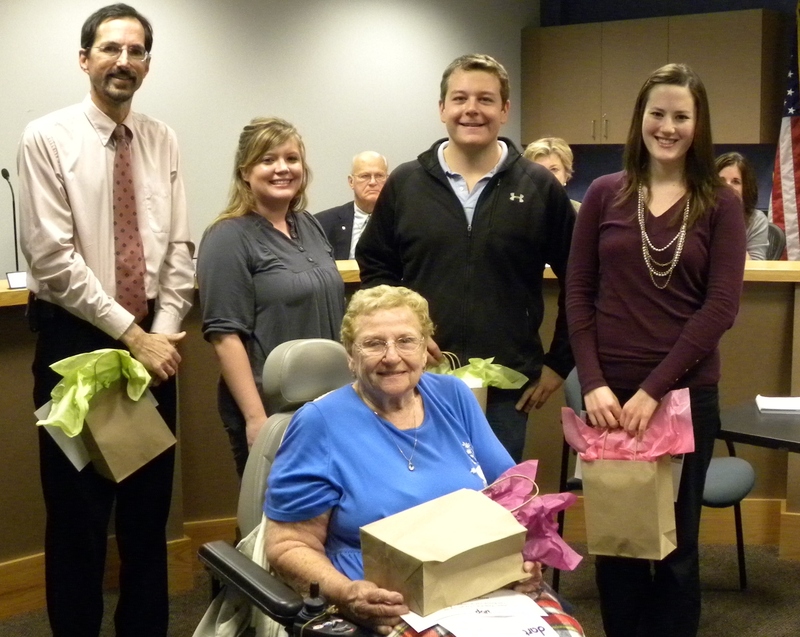 Back row, from left: Steven Suvalsky, Jessica Triggs, Alexander Grgurich and Jennifer Deutmeyer. In front: Myrtle Storm. The grand-prize video is not being released at this time, pending permission from a musician on the use of a song. The winning essays follow. My transit story started when I was younger and would take the shuttle to the Iowa State Fair. Social stigmas dominated my thinking that the bus was for those that could not afford a car and being seen waiting for the bus or riding one was akin to using food stamps in the grocery line. My early trips to the Iowa State Fair tore down those misconceptions when I saw people from all walks of life using the bus. As my family would ride from the State Capitol to the Fairgrounds, we could dream up what we were about to enjoy at the Fair and spend that time interacting with other human beings and forming relationships with other riders. Fast forward a few years and the “green” movement is in full force. I try to consider myself a sustainability advocate and take steps to live as such. As I continually put miles and miles on my car, spending hundreds of dollars on fuel, I thought there must be a solution. I noticed there was a “park and ride” near Norwalk, the town I was living in at the time. After trying it out a few times, I found it to be a great experience. Not only could I save money and wear-and-tear on my vehicle, I E find ways of being productive during my commute. I, like many others, try to live principally, but really find lasting solutions when my principles match up with my economic well-being. Now that I was using DART for my commute, I was able to do the right thing and have it save me money. My transit commitment deepened when I made the decision to move to downtown Des Moines. Having more of a comprehensive transit solution via DART, now that I was downtown, I sold my car and have been living car-free for just over a year. This has forced me to be more conscious of each trip I take and decide if it was really necessary. The typical day of running around while trying to grow my small business became a much more methodical, focused exercise in productivity. I am now much more productive in my business and enjoy my time much more. Instead of running to a client meeting in my car, I can take the bus and go over notes and prepare for the coming presentation. In addition, taking the bus has improved my quality of life by forcing me to become more active. Although I do exercise with weights at the gym, I’ve discovered the benefit of walking and riding my bike more as a result of the bus. In order to get to my destination, I will often have to walk a few blocks or take my bike on the bus to get where I need to go. These miscellaneous short-haul trips add up to quite a bit of activity and allow me to enjoy the benefits of exercise without even thinking about it. I’ve been able to reap so many quality of life benefits from DART transit that I must say that my quality of life has truly improved in many ways. I can not only “walk my talk” in regards to my sustainability principles, but can also save money, be more productive with my time, and be more active in my lifestyle. I applaud DART for all of the innovative technology it is planning to use in the future and taking a proactive approach to transit in Des Moines. I worked for DHS in the Decatur County Office for 2 years, before 88 employees statewide were laid off in June of this year. I thought my life was over. I cried night after night trying to figure out how I was going to be able to provide for my family. They depended on me and my job to carry the ever important health care benefits the state provides for its employees. There was no way we could afford our own private insurance, and we didn’t qualify for any government assistance. What was I going to do? For months we knew the state was in a budget crisis, and that no state employee’s job was “safe”. At this time I decided to apply for other jobs ‘just in case’. On June 14th I interviewed with the Iowa Department of Management located at the State Capitol. This job was 92 miles away, as I live in Mount Ayr. I had a lot to think about. First, what a long commute! Second, driving by myself every day, would I be able to stay awake? Third, how would I afford the gas to drive 184 miles daily? And fourth, did I really want to take a job that would require at least 1,000 miles on my car a week, and over 45,000 yearly? That would mean you would have to buy a new car every 2-3 years. I pondered on these questions for a couple of days before they called me on the 16th to offer me the position. They needed an answer fairly quickly, as the position I would be filling would be vacant in 2 weeks. I turned to my friends and co-workers at DHS to get their opinions. They all thought it was such a great opportunity, but also brought to my attention the time away from my family, and the harsh Iowa winter weather. Just when I thought I knew what I was going to do, I figured out I didn’t really know at all. That’s when one of my co-workers suggested RideShare. Her sister was a driver and had done it for several years. I hadn’t ever heard of RideShare and decided to look into it. My husband and I talked that night and decided I needed to take the job and if down the road I decided to do RideShare, we would go down that route. I started my job June 25th, and decided to drive myself for awhile. To be honest, I had kind of forgotten about RideShare. The drive wasn’t too bad by myself but after a few weeks I caught myself trying to doze off driving down the interstate. I was also putting $80 in gas in my car a week, having to fill up every 2 days. My car was getting 1,000+ miles on it a week, and my husband was having to change my oil every 3 -4 weeks. I was leaving early, and left my husband as the primary caretaker of my children. When I got home in the evenings I was so tired from the commute, I barely had enough energy to prepare supper, do laundry, and even play with my kids. My relationship with my husband was strained as the stress of the commute alone, the financial burden of filling up my gas tank weekly, and my complete and total exhaustion started to wear on me. Finally after 2 months, I decided to check into RideShare. On September 1, I had my first “RideShare trip”. I was nervous at first because I didn’t know anyone in the van, and what they would think of me. But boy was everyone warm and kind! Everyone introduced themselves and chattered on the way up, and I felt right at home with them. I liked how they seemed like their own little family, and I was excited to be a part of that. I caught myself taking naps in the morning, and once in a while on the ride home. I was now getting 2 hours of extra sleep a day! I felt like a whole new person. Not only that, but I was only filling my car up once every week, or week and a half. I drive 20 miles to our pick up spot, and then I kick back and nap, read a book, or chatter with another rider. I can’t begin to explain the impact it has made on my personal life. I pay $233 dollars a month, and I’m set for the whole month. I get 2 hours of extra sleep, giving me more energy to play with my kids, make supper, chat with my husband, and do homework with my daughter. I am putting 40 miles on my car a day, rather than 180. I also have a great group of riders to laugh with, crack jokes at, and complain about whatever is we decide to complain about at that moment. I can keep my job I was worried I would have to quit, and keep the health insurance my family needs. I truly believe if it wasn’t for DART and RideShare, I wouldn’t have been able to keep this job. My quality of life has greatly improved since I started this job. I now have the financial as well as the emotional means to be there for my family. I never imagined RideShare would be so beneficial to me financially as well as personally. I can’t thank DART enough for this wonderful transportation system, and their wonderful drivers. My name is Myrtle Storm and I live at “The Rose,” an assisted living facility on 1331 Idaho St., Des Moines, Iowa 50326. One day a fellow resident asked me why I didn’t use DART buses to go shopping? I didn’t know anything about it, so he gave me a number to call. I did so and a very helpful, pleasant lady told me she would send me an application. I filled it out and was accepted into the program. The Iowa State Fair was on that week, and my son had taken my grandson to experience the Fair and had told me about it the night before. I called the DART number to ask a question and conversationally asked the dispatcher if she had attended “the Fair” yet. I told her that I would really like to go but didn’t think it possible because I have several health problems that make walking long distances impossible. Unless a person has been confined to one place for a long period of time, it would be hard to imagine my joy and exhilaration at being out in the public, on my own. I saw the butter cow, beautiful flower and plant arrangements, business booths, bought the $8.00 turkey leg, chocolate covered ice cream bar, tiny do-nuts, etc. And then – I saw it. The Double FerrisWheel! And yes, you guessed it. I bought the ticket and had the breathtaking ride of my life. I shall always treasure that special day and have DART to thank. The last 5 years of my life have been full of surgeries, therapies, severe pain – over six months in nursing homes and not being able to go places. Now with DART available I know that I am not apartment-bound. The people at DART have been the most kind, understanding folks you ever want to meet. I am very, very grateful for DART services. My vehicle just celebrated a 16-year anniversary of staying in the garage while I (its owner) marked the occasion in the manner I enjoy, a short walk before work to my neighborhood bus stop followed by conversations with a circle of friends on the Des Moines Area Transit (DART). My DART experience began as a choice to save on parking fees and get to work on time without the stress of traffic jams. Meeting commuters of all ages and backgrounds, sharing news stories, hearing the weather of the day and arriving on-time to work have replaced my “vehicle and me” routine. Oh, there are times when my vehicle does leave the garage before the weekends, but not very often. The fraction I pay for a monthly DART pass above what is subsidized by my employer means I can ride round trip to downtown Des Moines and back home in just 7 days to recoup the $2 express fee I’d pay each way for the month to break even. Or I could drive everyday and pay out 4-5 times the DART monthly fees in gas! This savings was my initial “keep the vehicle in the garage” idea! Later I learned that frost, snow, rain, road construction, heat, wind chills and humidity just weren’t excuses for getting into my vehicle any longer! The differences of finding your car in a crowded parking lot, uncovering the snow as compared to walking into a dry and clean bus have become too great a difference now! Commuting alone just doesn’t make my vehicle as comfortable! Reading on my way to work or on my ride home means I am prepared to start my day or relax in a manner I never thought about prior to when I drove alone. The drivers and co-riders have become family who watch out for me and each other. In my 17th year, DART has made life in the Des Moines area for me more simple, economical and ecological! There are even gatherings of riders from various routes at local shops planned in advance and at the holidays just to share more time together. I proudly introduce family members to my “DART family members”. DART has become like a “moving neighborhood”… The word “regional” has become more prominent over my years as a commuter. My DART experiences have been so much more than a simple commute on a bus. There are so many friendly commuters waiting to meet you…I hope you will give DART a try! 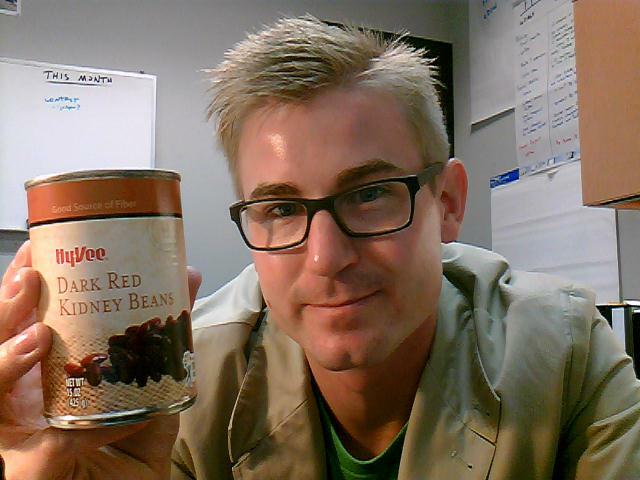 Your faithful editor of the bus blog paid his bus fare this morning with a can of beans. Never mind the employee bus pass. The donations collected as part of DART’s three-day Food Ride, starting today, go to the Des Moines Area Religious Council, which distributes food to 11 food pantries throughout Greater Des Moines. Ride any of DART’s services all weekend with donations of food items. A good deal for good cause. We all have our reasons for riding public transit and many of us feel strongly about them, especially when trying to explain to non-riders why we choose to take the bus or ride in a vanpool instead of driving our cars every day. Now’s your chance to tell a wider audience. DART is holding a “Tell Your Transit Story” contest — win an iPod! — in order to gather the real-life stories of real riders. A handful of these stories will then be used as part of a marketing campaign to spread the word about the many benefits of public transit. Entries can be submitted by video (3 minutes maximum) or in writing (1,000 words or fewer) to DART by Friday, September 24. Submissions should be in one of the following categories: Economy, Environment, Energy and Quality of Life. The grand prize winner will receive an iPod Touch and the 1st place winner in each category will receive a new iPod Nano. For questions or additional contest details, call 515.283.8100. Entries should include the contestant’s name, phone number, email and employer (if applicable). Email entries to dart@ridedart.com or mail them to DART, Tell Your Transit Story, 1100 DART Way, Des Moines, IA 50309. Those of you who follow the bus blog already know why this author prefers taking the bus to work. I’m not anti-car; I just don’t enjoy driving amid morning traffic because I have no patience for impatient drivers, whose race track antics put me in a foul mood before I ever steps foot in the office. It is far preferable to leave the driving to someone else and listen to read a book or blog or newspaper while listening to Pandora on a BlackBerry. My commute is a time of calm, a respite from an otherwise hectic day. A couple of months ago Adam Hammes of Urban Ambassadors approached DART with a proposal. 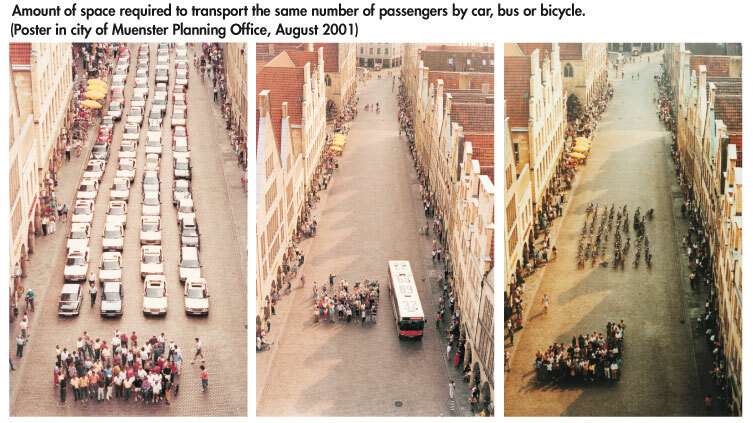 One of Urban Ambassadors’ board members, Drew Maifeld, had come across a series of three photographs taken in Muenster, Germany, that offer a powerful illustration of how much roadway cars take up compared to bicyclists or transit riders. Take a look at the photo for yourself and consider how much planning would have to go into it. But it was a cool idea, and Adam and Drew proved more than able to walk the talk. They assembled a team of partners including DART and put together a game plan. Now, they’re looking for volunteers to be in the photo. The shoot is scheduled for 2 to 4 p.m. Sunday, Aug. 8, on East Locust between 4th and 6th, with the Capitol to be framed in the background. You can be a Partner or a Volunteer! Contact Adam Hammes <adamhammes@gmail.com> or (515) 491-0706 to get plugged in. Urban Ambassadors is bringing together sustainable transportation advocates in Greater Des Moines to recreate the famous Munster, Germany photo (see profile pic) in our fair city. Plus, have a fun after-party to network and meet crazy, interesting, fellow residents! We need YOUR help to re-brand all forms of alternative transportation as a cause to advocate for, by everyone, not just bus riders and bicyclists. The benefits are many. Having the Capitol backdrop and framed by the East Village will make this a photo to remember. The social media blitz before and after will also add to the viral spread of this photo and promotion of Des Moines and the partners that make this photo happen! Good morning, fellow DART riders. Tomorrow is Dump the Pump Day, when DART and transit agencies around Iowa and across the nation remind the public at large of mass transit as an alternative to driving cars. So, whatever your reasons for riding the bus, share them with a friend or two today and suggest they give the bus a try tomorrow. Communities that invest in public transit reduce the nation’s carbon emissions by 37 million metric tons annually — equivalent to New York City; Washington, DC; Atlanta; Denver; and Los Angeles combined stopping using electricity. One person switching to public transit can reduce daily carbon emissions by 20 pounds, or more than 4,800 pounds in a year.